Three days ago I played in an end-of-the-year scramble. I hit the ball flawlessly for about the first six holes, then had a small collapse, but got it back again for the finish of the round. There was nothing wrong with my swing. It was all in my head. At first, all I thought about was swinging the club, just letting the ball go where the swing sent it. But I started thinking about hitting the ball little farther, or a little more intentionally somehow, and that’s when the problems started. Only until I went back to letting the swing do the work did things get better again. Part of it is that when you swing the club, you don’t have the satisfaction of you hitting the ball, of you making the shot happen. Golf is paradoxical in that way, that we have to cause a very precise thing to happen, but we have to give our entire body, not our sensitive hands and fingers, the job of getting it done. That means giving up controlling the club and the ball, something we find hard to do. So when I said to myself, just swing the club, because that is enough, things go better again. A lot better. So many golfers, especially at the start of their golfing career, think that hitting the ball is the object of the game. When they learn otherwise is when they start to get better, and in a hurry. 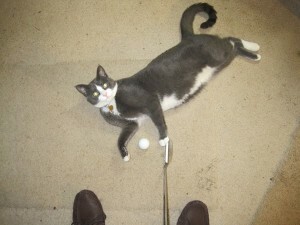 See what I have to put up with when I try to practice putting at home? It’s cold where I live, too cold to even go outside for much time at all. Forget about playing, how do we practice? Well, it’s not too hard, and you can end up practicing some things you should have been practicing, but never do. Putting on the carpet. Everybody knows that one. I like to putt at a tin can lid. You need something to align the putt to, to know that you’re not pushing or pulling the putt, but hitting the lid isn’t the important point. Making a smooth stroke is. In fact, don’t even watch the ball until you know it has gone past the lid. You can practice your chipping stroke, off a carpet remnant so you don’t damage the good carpeting. Plastic golf balls make good targets, and you’re practicing making good contact with a consistent stroke. Chip with a number of clubs, too, from you 5-iron to your lob wedge. Your swing? You can swing inside the house. You won’t hit the ceiling. Use a 7-iron or less, and there won’t be any problem. As for those things you should practice, but don’t? Get a block of wood to practice your takeaway. The club should start back straight for the first few inches. Toe the club against the block of wood and take the club back. You should hear a quick scraping sound, like striking a match. No sound, you’re taking it back inside. Long sound, you’re trying to take it back outside. Practice keeping your hands ahead of the ball at impact. My YouTube video on this point shows you how. Invent. Think of something. There’s lots you can do. To hit the ball straight, the clubface must be returned to the same position it had at address. From what I see, the two things recreational golfers do to ensure that does not happen are these. They start the club down with the right hand, in an effort to hit the ball, and their clubhead is the first thing that gets to the ball. You must start the swing down with a gravity move. Start turning your body and just let the club start moving by falling. It floats down to the hitting position supported by your two hands. It does not get pushed into the hitting position by your right hand. When your swing passes through impact, it must be led by the hands. There’s a race between the hands and the clubhead to get to the ball first, and the hands have to win. If they do, the clubface will be square. * If the clubhead wins, a square face is iffy. You can see that these two factors are related. Starting the club down by letting it and your hands fall gracefully sets up a natural pulling action, energized by centrifugal force, that lets the hands get to the the ball first. Result: square clubface, straight shot, powerful shot. I believe that if you practice these two things and make them a habit, you will hit the ball straighter, and straighter more often, than you believed possible. *Assuming a proper grip, of course.